I grew up in Anaheim. Anaheim-Western bell game was the biggest thing in town. I didn't even know about Servite or Mater Dei until I was in high school. "The Ghost of La Palma Park" is still the greatest nickname in OC sports history. Back when fields were grass and Xavier Hicks and Daniel Fells were playing the Morales brothers, Ronnie Hillman, etc..
League titles , CIF finals, La Habra and Fullerton have been rivals for a long time . This year is no different as Fullerton head coach Richard Salazar and a bunch of ex Highlander's are the new coaching staff at Fullerton. La Habra vs Fullerton game will be week one of League for the Highlanders. The Gridiron, this Rivalry continues, let's see if the Highlanders can keep dominating, as teacher vs students clash. Sixth Man wrote: I grew up in Anaheim. Anaheim-Western bell game was the biggest thing in town. I didn't even know about Servite or Mater Dei until I was in high school. "The Ghost of La Palma Park" is still the greatest nickname in OC sports history. I agree, 6M. Anaheim Colonist, class of '68. I was only six at the time, but when Randy Meadows and The Ghost attracted 41,000 people to the Coliseum to see them square off, it must have been electric. Six at the time? Was this the class of 1868? Yes, templar. But you knew that, since I went to the prom with your granddaughter. Norwich Free Academy (Norwich, CT) v. New London High School (New London, CT)	77–63–11 started in 1875. Annual Thanksgiving football game. One of the original annual Thanksgiving football games, but has not been played continuously. Earliest game was played on May 12, 1875. You are close give it take a year Templar, I believe I have seen a photo of MDDad in the stands at the that first American College Football game between Rutgers and Princeton in 1869! I think he still has the stat sheet...! Newbury park vs Thousand Oaks turned 50 this year. I imagine Buena vs Ventura and Atascadero vs Paso Robles are pretty old also. Moorpark vs Carpinteria went for about 80 years straights until the late 90s. Carpinteria won 51 straight until the last meeting in 1997-moorpark won 37-0 in the playoffs and they haven't played since. 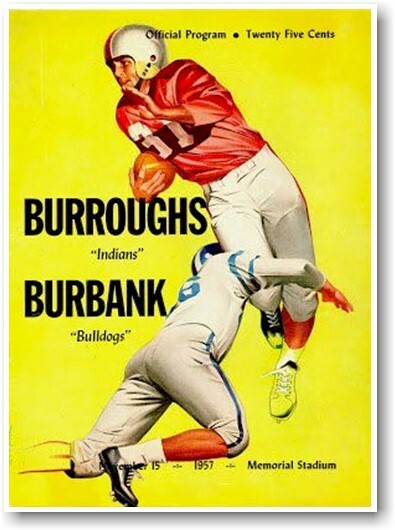 John Burrroughs vs. Burbank. 69 meetings since 1949; both teams share the same home field (Memorial Stadium on the JBHS campus), and alternate year-to-year in getting the larger "home side" in the Big Game. As many as 12,000 fans have packed the stadium for the annual year-ending contest between crosstown rivals. In 1979 Burroughs went into the game rated the number one team in the San Fernando Valley, Los Angeles, Southern California, the State and the Nation. Burbank put up a strong fight, scoring 12 points against a team that had badly beaten the previous #1 team, St. Paul, 27-12, and allowed only one touchdown to four previous Foothill League opponents, outscoring them 152-7. Burroughs finished the season 11-1 and advanced to the CIF Quarterfinals. another one from Ventura County: FIllmore vs. Santa Paula-continuous since 1924. 61 years of La Habra vs Fullerton playing each other. This Friday at La Habra HS will mark another year. Fullerton is celebrating its 125th year as a city. This year is a interesting year , as this Rivalry takes on a Local feel. Why would this year take on a "Local feel"? Are you saying that locals usually don't wear the uniforms of the two teams? Downey vs. Warren High School, still has to be one of the top ten. It is a true cross town battle. In the 70's to 90's would draw 12k at Cerritos Stadium. The game still draws 7 to 8k, at both schools newer stadiums. They have to bring in portable bleachers if both team are doing fairly well. Sure wish they would bring in portables to Davidson Field for this years "Battle of the Bay". Cdm has taken a proposal to the district to put bleachers behind the end zone for this years battle of the bay. The bleachers would be for students only similar to the Lions Den at JSerra. Last I heard it was close to gaining approval. Cdm will be floating the cost for the temp set up. It would be a nice twist to the rivalry. Unfortunately the game will be over by halftime. NH will give up 50 in the 1st half. Finally! It's been a while... but that gets an official "DRUMROLL" Ba-Da-Boom Omar!